The Lamington Bridge is a 121 year old, heritage listed road traffic low-level concrete bridge joining Gympie Road and Ferry Street over the Mary River in Maryborough Queensland, Australia. Designed by Alfred Barton Brady, M. Inst. C.E., the bridge is an important piece of world bridge engineering history. The bridge is visible from Huntsville Caravan Park. The Lamington Bridge, constructed 1894-1896, was built out of necessity, after the previous bridge was partially destroyed. 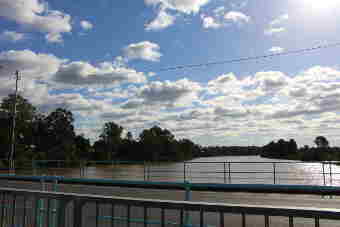 A ferry service, Princess Ferry, began operation in January 1864, connecting the Maryborough Township and Tinana sides of the river. During Gympie’s gold rush, the ferry could transport 500 people per day. 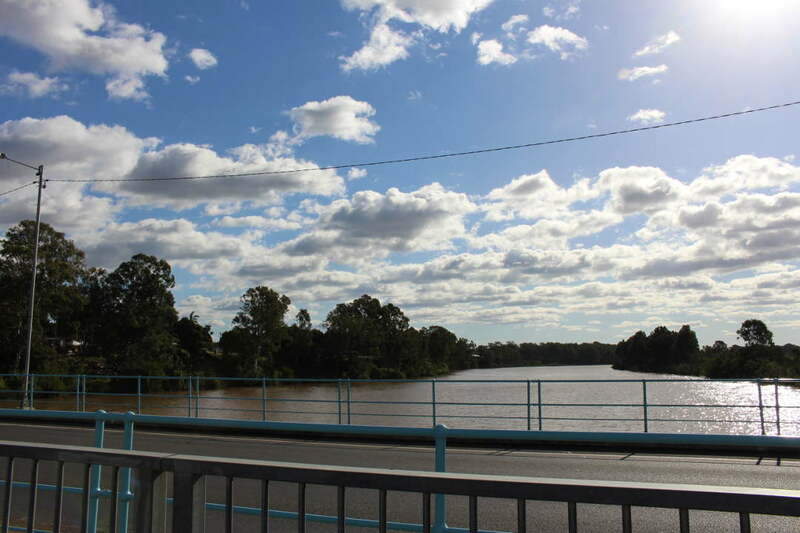 The Maryborough Bridge, a high-level timber bridge was opened 1st January 1876. 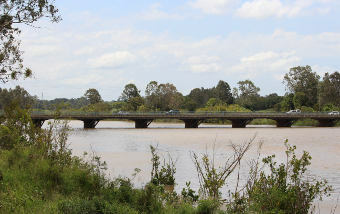 The timber bridge joined the Tinana and Maryborough Township sides of the river. The high-level timber bridge was partially destroyed in 1893. 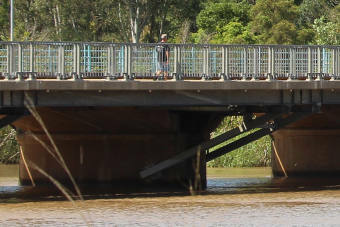 The damage to the bridge severed communication and transport between Maryborough and Tinana, Gympie and other southern localities. 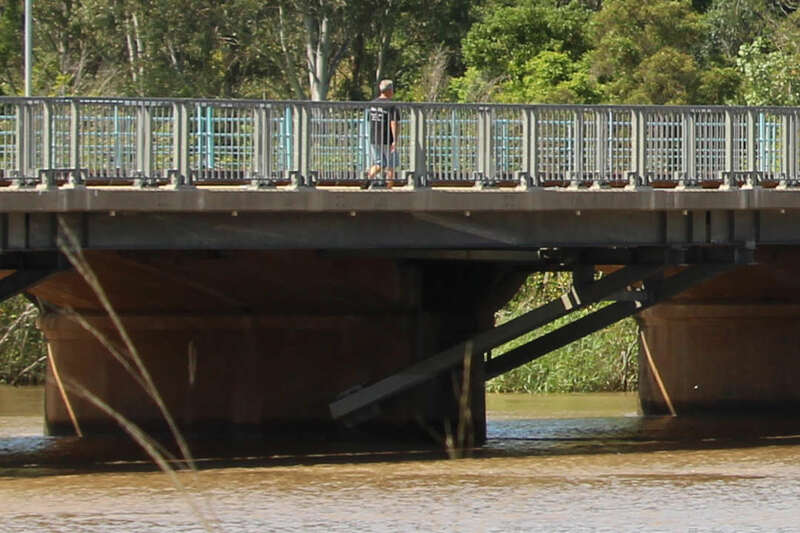 The Queensland Government and Maryborough Bridge Board made the decision to replace the old bridge with a new, low-level concrete bridge. In addition to being less susceptible to damage, a low-level bridge would cover a shorter distance, meaning fewer maintenance expenses in general. The shorter bridge would be 613 feet (187m), compared to 1456 feet(444m) for a high-level bridge. A steam ferry was commisioned to operate in the intermediate, transporting people and vehicles across the river while the bridges were non-operational. Thorough consideration was given to the placement of the Lamington Bridge, making use of surveys, soundings and borings. The new bridge was built downstream of the destroyed bridge. Brady recommened a concrete bridge on the basis of very great strength, almost everlasting character, and minimised maintenance expenditure. With Brady’s design approved by the Maryborough Bridge Board and Queensland Government (bridge plan signed 11th June 1893, approaches and fencing plans signed 18th June 1894), tenders were invited, and let in September 1894. Total cost of construction including approaches, engineering and supervision was 25,000 pounds. 11 at 50 foot clear (15.2m) or 54 foot (16.6m) centre to centre of piers. The abutments were constructed of: 5 parts hard stone (2 inch (5.1cm) guage), 2 parts clean sharp sand, 1 part Portland cement, supported by ironbark piles driven to solid foundation. The superstructure was constructed of: 4 parts hard stone (2 inch (5.1cm) guage), 1 & 1/2 parts clean sharp sand, 1 part Portland cement. The arches were strengthed by a framework of continuous steel railway lines, spaced 2 foot apart (0.6m), weighing 41 & 1/4 lbs per linear yard (20.5kg per meter). Earch pier construction consists of two rectangular columns below water level and arched over between the low and high tide levels. The piers are continue solid to the springing of the arches. Pier foundations were de-watered by means of a canvas baler, 2 foot 4 inch (0.7m) diameter x 4 foot (1.2m) deep. The baler could discharge around 3,000 gallons (11,356L), or 35 lifts each hour. The deck of the bridge featured two gully chambers were formed in the concrete every 54 feet, covered by wrought-iron grates, and 4 inch (10.2cm) outlet pipes through the arch directly into the river below. The original handrailing was made of wrought-iron stachions fitting into galvanised cast-iron sockets set in the concrete curb.The original handrailing was made of wrought-iron uprights fitting into galvanised cast-iron sockets set in the concrete curb. The three rails were made of gas pipe, the top two being 1 & 1/3 inch (3.4cm) bore, and the bottom rail 3/4 inch (1.9cm) bore. The parapets were made in 13 foot 6 inch (4.1m) lengths. The bridge was lit by gas-lamps on the upstream side of the bridge. Three lanterns on cast-iron standards at both ends of bridge, and intermediate lamps with single lanterns along the bridge. The contractor that began construction of the Lamington Bridge failed financially in May 1895 before much work was achieved. A second contractor, Messrs, was signed on 26th July 1895, by McArdle and Thompson of Brisbane. The work was completed within the allowed time of 15 months. Pouring of concrete for the 1 arches was completed in 22 days (half an arch a day). A.J. Goldsmith worked as Superintendent Engineer on the project. The bridge’s original roadway consisted of 5 inch deep iron-bark block paving with boiling coal tar coating. Joins were filled with a boiling coal tar and clean sharp grit or river sand mixture, making the surface waterproof. The bridge paid over a 50 year period, ending June 1949. 1/3 was paid by the Tinana Divisional Board/Burrum Shire Council, and 2/3 by the Maryborough City Council. Total cost to final payment was approximately 35,000 pounds. 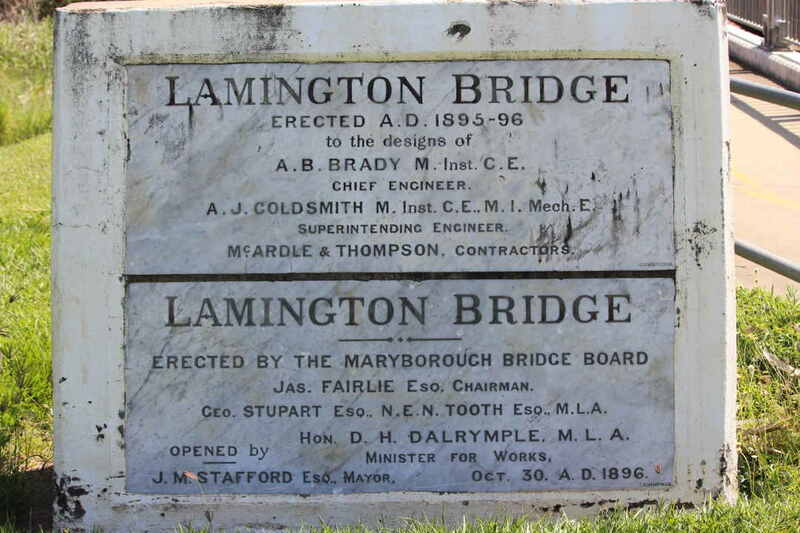 The Lamington Bridge was formally opened to traffic 30th October 1896, by the Hon. David Hay Dalrymple, M.L.A., Minister for Public Works. A large public attendance witnessed the opening. A stone and marble plaque was placed beside the bridge, with the below verbiage. A.B. BRADY M. Inst. C.E. A.J. GOLDSMITH M. Inst. C.E., M.I. Mech. E.
CEO. STUPART ESO., N.E.N. TOOTH ESO., M.L.A. HON. D. H. DALRYMPLE, M.L.A. 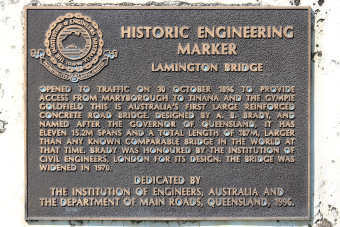 The bridge was included on the Queensland Heritage Register 21 October 1992. 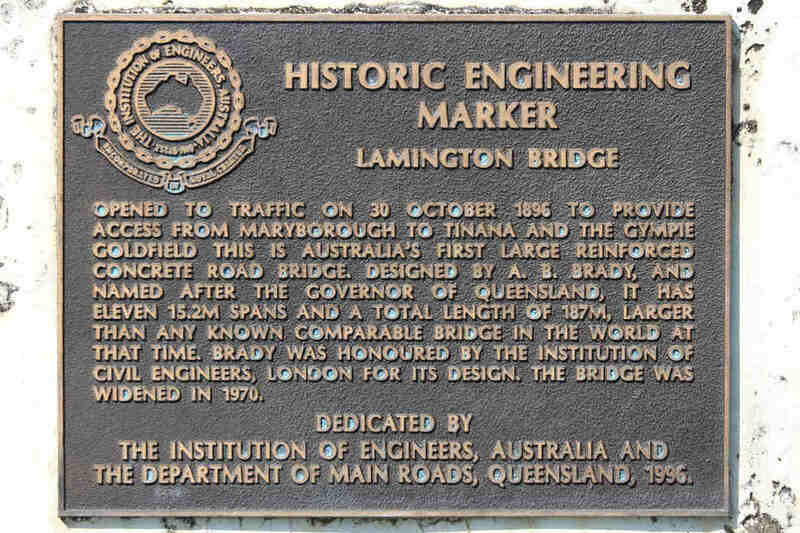 A large, reinforced concrete road bridge, the Lamington Bridge was the first of its kind in Australia. It is recognised globally as a significant piece of engineering due to the date of construction, and size of the bridge. Mr A B Brayd, the bridge’s designer considered the bridge type as a flat arch, however it is accepted the reinforcement and form result in behaviour of a continuous girder. The bridge’s spans are haunced solid concrete girders with arched soffits. Brady attributed the bridge’s strength to the flat arch, and provided steel reinforcement in the tension areas in the top of the girders at mid-span. The world’s first concrete arch bridge is dated about 1890, and conventional reinforced concrete was used from about 1900. One of the first concrete girder bridges ased on the Wuntsch system. It is believed to be larger than any known comparable bridge in the world at that time. Brady was honoured by the Institution of Civil Engineers, London with the Telford Premium prize, for the Lamington Bridge’s design. AH Brady spent 37 years working in Queensland Government departments and was a major contributor to Queensland in both architecture and engineering design. 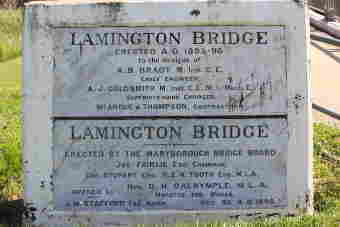 Maryborough Family Heritage Institute Inc, Maryborough, Wide Bay and Burnett Historical Society Inc and Department of Main Roads, Queensland jointly organised the Lamington Bridge’s centenary celebrations for 26 October 1996. The Queensland Division of the Institution of Engineers, Australia initiated a plaquing ceremony for the day. The Town Crier and Mary Heritage were both in attendance. Beginning at 8:30am, celebrations ran all day, with a ‘1896 atmosphere’, full program consisting of activities such as, fishing competitions, art competitions, ye olde fair & market, vehicle displays, band performances. The public could witness firing of the cannon, heritage sports, water skiing display, rowing exhibition, radio controlled boats. The plaque was unveiled by the Honourable Rob Borbidge, MLA, Premier of Queensland and Mr Cliff Button, President of Queensland Division Institution of Engineers, Australia. The bridge was closed to traffic for three hours from midday. Local school children performed a re-enactment of the original bridge opening. Borbide, Button, Mr Warren Truss, M.L.A. Federal Member for Wide Bay and Councillor Alan Brown, Mayor of Maryborough gave speeches before the cutting of the ribbon to ‘open’ the bridge. Opened to traffic on 30 October 1896 to provide access from Maryborough to Tinana and the Gympie Goldfield this is Australia’s first large reinforced concrete road bridge. Designed by A. B. Brady, and named after the Governor of Queensland, it has eleven 15.2m spans and a total length of 187m, larger than any known comparable bridge in the world at that time. Brady was honoured by the Institution of Civil Engineers, London for its design. The bridge was widened in 1970. Dedicated byThe Institution of Engineers, Australia and The Department of Main Roads, Queensland, 1996. An official dinner was held that evening. In 1898, the roadway was changed from iron-bark block paving to tarred metalling, an average depth of 6 inches. The bridge was widened in 1970, from the original 20 feet 8 inches between kerbs, to 28 feet between kerbs (estimated cost $106,821). This modification made allowance for walkways on either side of road. The bridge no longer features the original style street lamps, instead lit by current-era electric street lights. 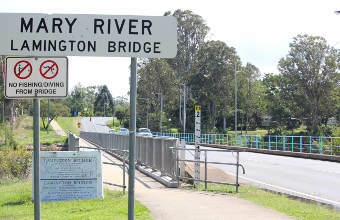 Until the opening of the Maryborough Bypass in 1990, Lamington Bridge was an important component of the Bruce Highway connecting from Brisbane up to Cairns. A shared bikeway/walkway was added to the downstream side of the bridge in 2005, separating cyclists and pedestrians from vehicle traffic to improve safety (cost almost $1,700,000). Steel framework bolted to the bridge supports concrete decks, with their own steel handrails on both sides.